Editors: Kirk, P.M., Cannon, P.F. and David, J.C., et.al. 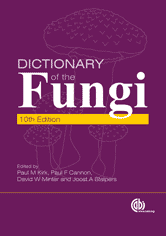 Provides the most complete listing available of generic names of fungi, their families and orders, their attributes and descriptive terms.